In reviewing several health measurement tools, I came across a Patient Health Questionnaire (PHQ-9) that was provided to me in a paper based format. The objective of this tool is to assess a patient’s level of depression and it has a manual scoring element. 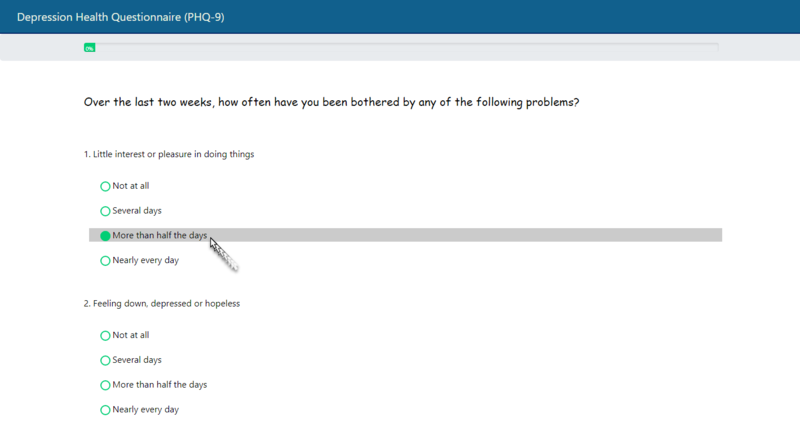 As I have an Enterprise level account of the FactFinder Solution powered by Jitsutech – I thought “Why not give it a shot!” In less than 15 minutes, I was able to draft up this questionnaire template, add in the scoring key and give pre-determined feedback upon clicking of the submission button for patients to understand their score. This Canadian Hosted Survey Platform is capable of taking paper based health measurement tools such as the Patient Health Questionnaire (PHQ-9) and automatically score them for you. You can connect to this Questionnaire using a Smartphone or Tablet from any location. Click Here and try it on your Mobile Device.